As a runner, you strike the ground 1,000 times per mile, with a force of two to three times your body weight. You can feel that impact in the muscles, ligaments, and bone structures throughout your body. 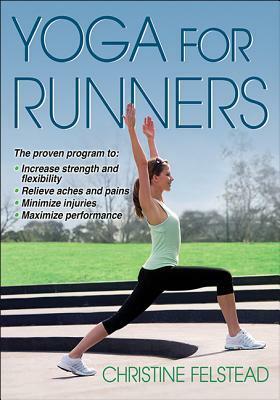 Thankfully, “Yoga for Runners” addresses both the physical and mental demands of the sport. Whether you are new to yoga or have practiced for years, “Yoga for Runners” provides you with the most effective poses–88 poses in all. Each pose is described in detail to ensure correct execution, maximizing the physical benefit and decreasing the risk of injury. You’ll learn how simple yoga techniques can be incorporated into your existing running workouts and routines to eliminate chronic aches and pains. Discover how each pose can be sequenced to address a specific need, such as strengthen and lengthen the hamstrings, strengthen and increase mobility of the hip joint, eliminate lower-back and upper-body discomfort, speed the recovery process after a practice run or a race, maintain a strong core, or just restore and rejuvenate to prepare for an upcoming event. These sequences target all troublesome muscle regions. Anatomical illustrations and descriptions explain why these poses and sequences decrease your risk of acute or chronic injury as well as why they are beneficial to your training regimen. I say that I am inflexible is probably the understatement of the year. Similar to weight training, I find it really easy to not do my daily stretching in favor of getting another swim workout in, or going for a run. Partly because my dog tries to help (in the way only a German Shepherd can) and partly because if I sit down on the floor, 9 times out of 10, sleep is probably going to ensue (there is something about laying down that just gets me every time). But I came across this book at the library one day and I was intrigued because it talked about how you could squeeze yoga in to your daily life, which (for as obvious as it should have been) stunned me. My perception was always that I needed to dedicate an hour or so to go; find a studio that worked with my insane schedule, or buy/borrow a DVD etc. This book totally changed me mind on that. While the first few chapters focus a bit on the history of yoga and its application to helping runners, the meat of the book is the later parts where it discusses all the different positions/postures you can do; what body parts each of them help with and towards the end simple progressions that can be done (some in less than 10 minutes) to help. So come back from a run, spend 10 minutes doing a quick set of sun salutations and move on – it is definately, something I know that I will be incorporating into my training. Unfortunately for me, the book was a library book and i didn’t really want to/couldn’t photocopy all the stuff I wanted to – so I’m planning on ordering it and adding it to my growing library of training references. Like a previous review of a strength training book, this one is hard to rate until I have a chance to fully test out the various sequences, but never fear, I shall let you know.